I simply cannot think what to name this recipe. I thought possibly, “Indian Spiced Chicken and Cabbage,” but perhaps “Americanized Indian” would be better. 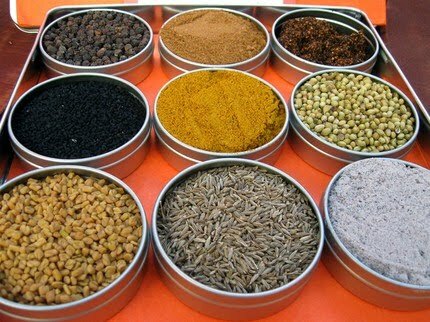 If you are in the habit of grinding elaborate masalas and cooking with a variety of spices and curries, this recipe may seem hopelessly oversimplified to you. However, if you are wetting your feet to the world of international cuisine, this Americanized dish is definitely one for your growing file. Oh, and if your spice cabinet is bare or sadly out-of-date, read on. With a little help from my new friends at Spice Station, one lucky reader will soon be on her way to cooking glory! 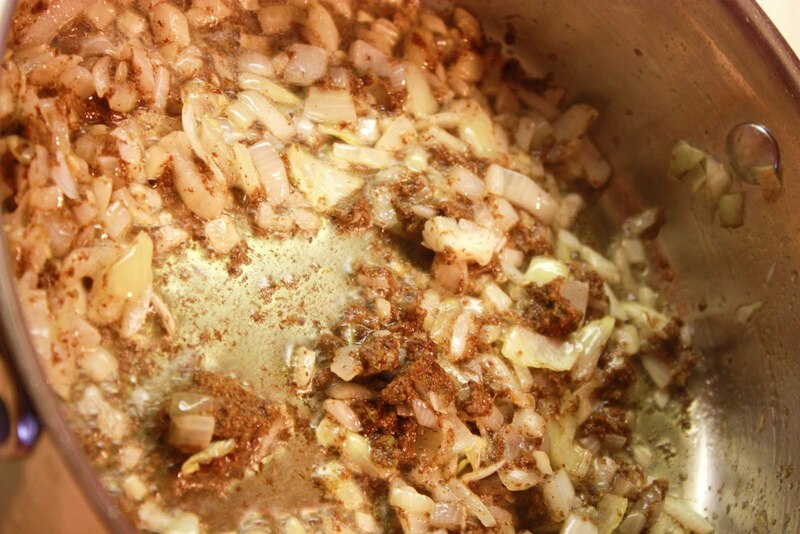 Chop one medium onion and saute until translucent in two tablespoons of oil. 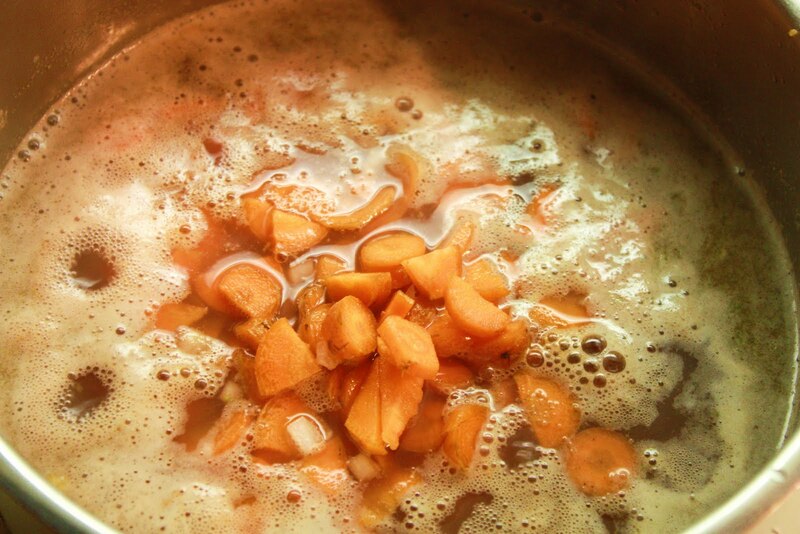 Then, add the masala (minus one teaspoonful), and stir until the oil and the masala begin to separate. Next, add two pounds of chicken*, cover, and cook over medium-low heat for twenty minutes. *I used legs and thighs that I had precooked in a 350 degree oven for twenty minutes. 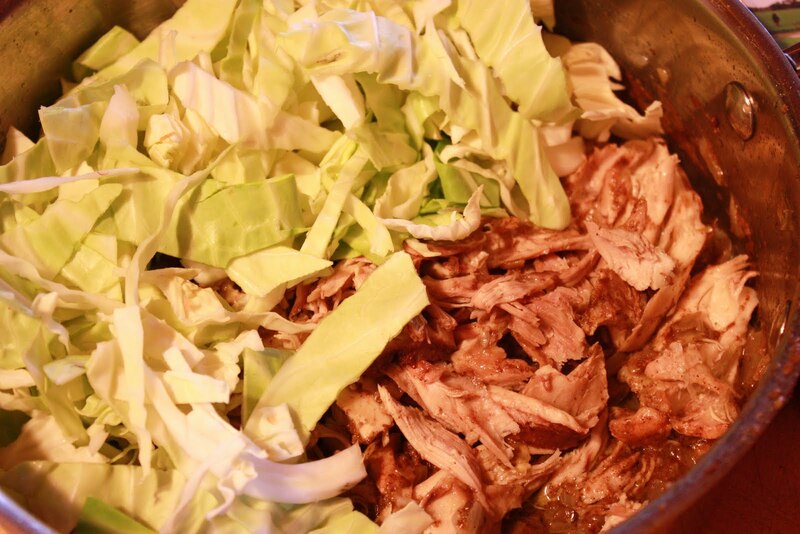 After the chicken has been cooked, shredded, and returned to the pan, add two cups of shredded cabbage, three tablespoons of chicken stock and one teaspoon of salt. Cover and cook over medium-low heat for an additional twenty minutes. 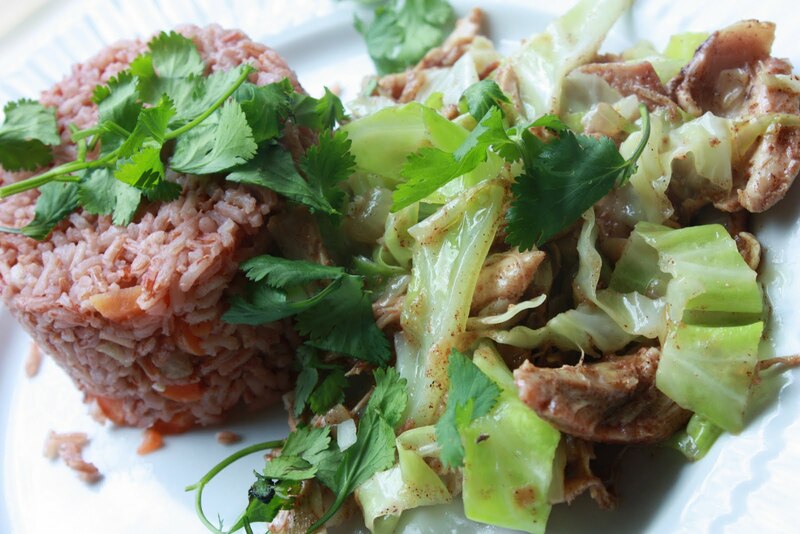 While the chicken and cabbage are cooking, prepare rice or noodles. Today, I made a chewy Red Thai Rice seasoned with the remaining teaspoon of masala (added to the cooking water) and two chopped carrots (added at the boiling point before covering and steaming for fifteen minutes). 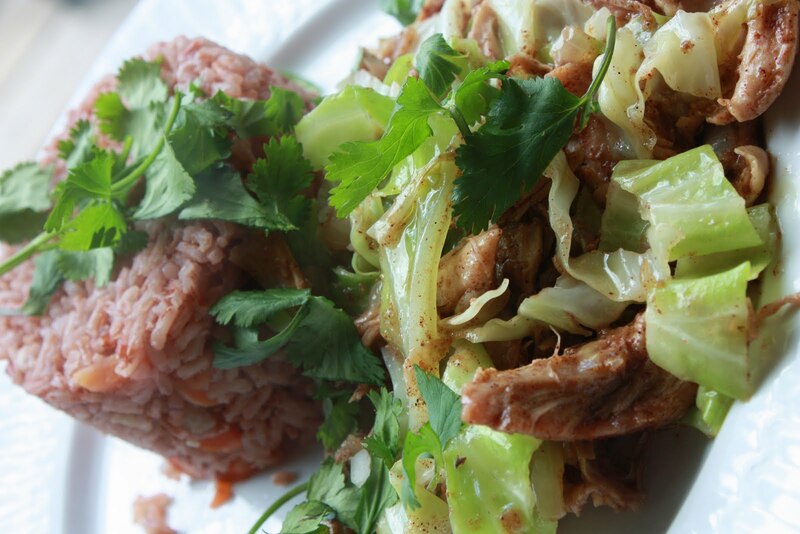 Serve hot and garnished with fresh cilantro. And now for a special, and spicy, word from our sponsors! The generous folks at Spice Station would like to offer a $25 gift certificate to one very lucky Healthy Moms and Kingdom Twindom reader! 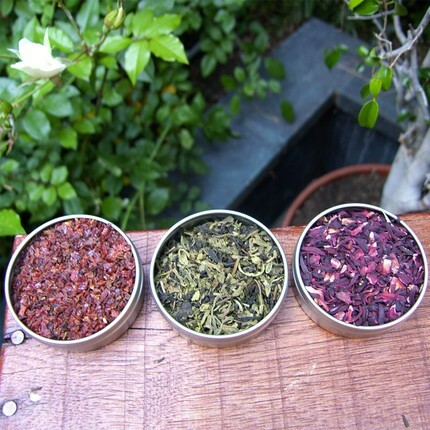 Breathe deeply; can’t you just smell those amazing spices? And wouldn’t your recipes improve by leaps and bounds if your kitchen was fortunate enough to host these?! To win, simply visit the Spice Station store and have a good look around. 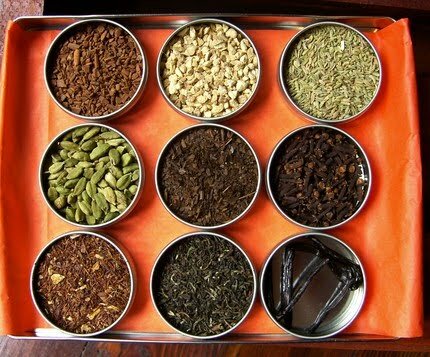 Once you’ve picked out something you love (which shouldn’t take long at all – they have teas and spices galore! ), simply hop over to my blog and comment with your find. And that’s it (no hitches or hassles)…I’ll pick the winner via random.org, over at Kingdom Twindom, on May the third. Good luck…and happy, spicy cooking to you all! Oh Sarah…this looks so good!!!! How do you come up with this stuff!?!? :) Of all the times for my printer to be out of commission…I'll be back to print this! Thank you for sharing! This looks soo very good!! Oh my goodness! I'm breathing deeply and I'm suddenly starving. That looks fantastic! This looks delicious and I love the twist you took on it!!!! This sounds like a delicious treat for my taste buds!! Thanks for sharing! OK, I so want EVERY SPICE ON THIS POST! 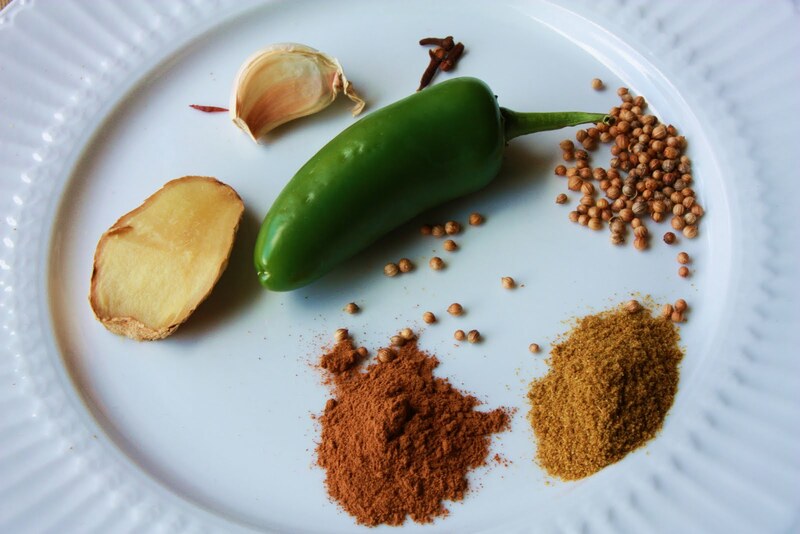 I love spices and really don't have anything other than the “standards.” Yummy recipe too!